We've seen hybrid laptop-tablets hybrids before, but the Asus Transformer Book Trio has a third skill – it also works as a desktop PC. Plug a monitor into the keyboard base, and hey presto, you've got a workstation. Most hybrid devices – like the Microsoft Surface Pro 2, for example – run Windows in both form factors. The Transformer Book Trio, however, runs Windows 8 in laptop mode, and Android 4.2.2 Jelly Bean when used as a tablet. It works much like the Asus Transformer Book T100 – detach the screen, and it becomes a tablet. Are its extra skills enough to make it stand out from the competition though? Or are they gimmicks? Let's find out. The Asus Transformer Book Trio has an 11.6-inch screen, which we find is a good size for a laptop. It's big enough to see what's going on on-screen, but still pretty portable. It does make it a bit on the large side for a tablet though. The tablet portion tips the scales at 700g – that's more than 200g heavier than the feather-light iPad Air. You'll notice it's in your bag, in other words. The whole shebang weighs 1.7kg, which is enough to give you shoulder ache if you're lugging it long distances. That's understandable though, considering you're effectively carrying around three devices in one. Build quality is very good. It's made of brushed aluminium, and feels very well put together. Hold the button above the keyboard down and you can easily detach the tablet, then it slides back into place without any complaints. The base is heavy enough to stop the device toppling over, even when you tilt the screen back as far as it goes, so there is an upside to that extra bulk. It's also a little on the chunky side, measuring up at 304.92x193.78x23.6mm. 9.7mm of that width is the tablet – that's 0.3mm fatter than the iPad with Retina display – and the rest the base. As we say, you can forgive the fatness considering it's three devices in one. Press the power button on the base and it'll launch Windows 8. Press the dedicated button on the keyboard, and it switches to Android. Or you can detach the tablet portion, and this will power up Android as well. Plug the base into a monitor, and you've effectively got a Windows 8 desktop PC at your command. It's a doddle to use, and switching between operating systems is very slick indeed. One bugbear is that the tablet controls (power, volume) are on the back of the device, a bit like on the LG G2 smartphone. This means you have to blindly fumble around for them, whereas if they were on the edge – as with most tablets – you'd be able to find them quickly and easily. Another downer is that it runs Android Jelly Bean instead of KitKat (the latest version). The 11.6-inch screen has a resolution of 1,920x1,080 pixels, which gives it a pixel per inch rating of 190ppi. That's nowhere near the eye-ball soaking loveliness of the iPad with Retina display, which has 264ppi. A Planet Earth HD clip looked suitably luscious, though the colours didn't pop from the screen anywhere as near as much as on the iPad's Retina display. But the screen is nice and responsive, registering our every press, swipe and pinch. Both the tablet and laptop parts have their own innards. The tablet packs a 1.6GHz Intel Atom chip, 2GB of RAM and 16GB storage. It's pretty nippy, letting you whiz through menus, and browsing went without a hitch. More demanding games did show some slowdown, however. The laptop has a 1.6GHz Intel Core i5 processor, with 4GB of RAM and a 500GB hard drive. Windows 8 did feel a bit sluggish at times – this would be improved with solid state storage, though that would bump up the price even more. The trackpad is pretty terrible as well – it's unresponsive, and tricky to position the cursor where you'd like. The keyboard is also a little cramped, though the keys have a decent amount of springiness to them. 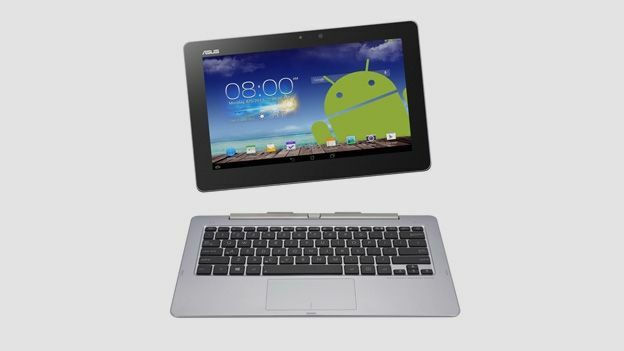 Asus claims that in Android tablet mode, the device lasts for 13 hours before needing a recharge. In Windows 8 laptop mode, it'll go for eight hours. In our test, we got about eleven hours as an Android tablet, and the quoted eight hours while using it as a laptop. These are both respectable, but not remarkable. The £900 price tag seems a lot, but it's not bad for three devices in one. Neither the desktop PC, laptop or tablet are outstanding on their own, but as a three-in-one package, the Transformer Book Trio makes a decent triple threat.